Oh you guys, it’s already starting to feel like Fall here in Seattle. We’re right in the middle of some sort of thunderstorm. I can’t believe it’s Pumpkin Spice Latte, cozy sweater, boots, and plaid season already. Though you can bet I am excited. To be honest though, I may be passing on the Pumpkin Spice Lattes this year, they really aren’t that good. Dark Chocolate Hot Cocoa on the other hand… now that’s calling my name. Along with the rainy, blustery weather comes even more excuses to marathon watch way too much Netflix. We’re stuck on The Killing right now. Holy wow, this show is amazing. It’s set in Seattle, which of course makes me happy (I’ll even let some of their, um, regional mistakes slide,) and it’s just so good. We’re constantly trying to be one step ahead of the show, but the plot twists are exquisite. Lovelovelove. But really, I don’t feel like any of these are real confessions. What I really have to confess is my obsession with the fall wardrobe. I’m all about the cozy and the warm stuff, and fall is my jam. I’ve had a little too much fun indulging some of those loves. I may or may not have bought a few too many fall boots, sweaters, and new jeans to tuck in said boots this weekend. Budget, what budget? I said. 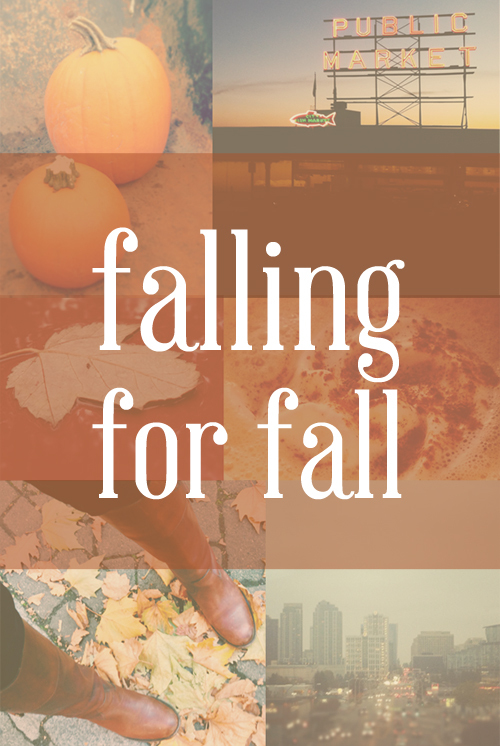 What’s your favorite part of fall? Are you a PSL lover or hater? Fall fashion, yay or nay? Tell me all the things. Agree,agree,agree! Adore fall for so many reasons (fashion being at the top), and I usually choose a hot chocolate or Caramel Apple Spice over the PSL. :-) I live in West Seattle, and can I just say how much our city rocks!? We too indulged in a TV marathon last Sat lol. I’m stoked to have stumbled upon your site. Have fun in Disneyland! My Minnie ears are magical. I put them on when we were driving back from Disney World and voila! no road rage! no assholes cutting me off! we always found the cheapest gas! They have also been useful at home. When I was moving last month and the movers couldn’t find the screws to my bed, I put on my Minnie ears and within 5 minutes, the screws were found taped to the bed rails (apparently my movers weren’t the brightest). I don’t even care if people can’t take me seriously with them on. MAGICS! I loveeee everything about fall. Pumpkin spice everything, lazy nights marathoning netflix, and sweaters and boots! I love it all! I gotta say I do enjoy a PSL, but a. apple everything is better than pumpkin everything and b. the salted caramel mocha from Starbucks is WAY underrated. It’s the real best fall drink. Can’t wait to sip on one while wearing a huge oversized sweater with leggings and boots! Oh nice! Disneyland! Have a blast of a time! I’m not ready for fall yet! I do love wearing jeans and boots but not until October ideally! Haha, I hear September and I immediately unpack my boots. It’s still fairly warm here so I think my knee high boots will not make much of an appearance until October though! I’m a PSL lover but I still haven’t had one! What is wrong with me? What season of The Killing are you on? I LOOOOVVVEEEDDD that show!!!! We’re just starting the third season! OMG the first two seasons were so good!!! I love a good pumpkin spice latte as much as the next girl, but give me some spiked hot apple cider + I’m the happiest camper. It’s still 98 degrees here, so the whole leggings + boots thing is so close, but so far away! Oooh, spiked apple cider sounds amazing! Cider really is my favorite fall drink if we’re being perfectly honest. ;) 98 degrees?! Dang, I hope it cools down quick! I love everything about Fall! I love all of the pumpkin stuff, but PSL’s I can take or leave. Fall fashion is my absolute favorite, all of the cozy sweaters, jeans, boots, scarves, etc.! Even though I love in FL and it’s still hot here, boo! Oh no! I hope it cools down soon so you can indulge in some fall fashion! I dont drink coffee, and I like my pumpkin in soups, not in drinks or pie, lol. But mmm love their hot chocolates! I love summer 1000 times more than fall, but I will say I love the fall fashion. But I hate real winter fashion because I don’t look like the girls on pinterest, i’m always so rugged up its not cute. I absolutely adore fall and have missed it dearly since moving from Canada to Barbados! Our fall is rainy season..boo. I’m not a fan of the PSL at all, but the PSL means that the peppermint mochas are just around the corner! PSL hater for sure. I always feel like they taste so chemically. I’d much rather just make my own pumpkin smoothies or drinks to get the legit fall flavor. Yes, that and too sweet! Definitely going to make my own instead this fall! HAHA too funny! I can’t wait to pull out the Halloween decor, that’s my favorite! You are going to love the Haunted Mansion! Hahaha, its one of my faves! My mom keeps telling me to watch the killing, I really need to start already! The first time I went to Disneyland I LOVED it and was so upset when it was closed. So, I’m really looking forward to it! Apparently it’s already gotten made over for Halloween too ;) YES watch it!!! I’m so excited for fall too! We are definitely still in summer temps here so it doesn’t feel very much like fall. I’m not a fan of anything pumpkin flavored, but I looove apple picking season! It’s definitely been cooling off here! It’s dropped below 70, and last night felt cold! Apple picking… sounds like fun! Oh I feel you, I really don’t like the super cold weather either! Anything below 40 and I’m not a fan! I’m pretty sure today is the last warm day of the season. Tomorrow we drop to 62 and stay below 70 for hopefully forever. I’m SO EXCITED! My favorite part of fall is chunky sweaters, a chill in the air, pumpkin everything, knowing that the holidays are coming. I love all of it. I could go on forever.